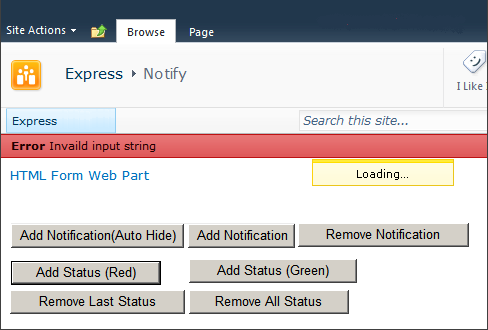 Here I will demonstrate you, How to Display Notifications and Status messages in SharePoint 2010 portal. “Wait…” or Status like “Thank you for contacting” “Your request has been processed” or Caught exception messages. strHtml = The message inside the notification. bSticky = Specifies whether the notification stays on the page until removed. Default notification remains for 5 seconds. strTitle [Optional] = The title of the status message. strHtml = The contents of the status message. atBegining [Optional] = Specifies whether the status message will appear at the beginning of the list. SP.UI.Status.setStatusPriColor(statusId, strColor); // Sets the priority color of the specified status message. statusId = The ID of the status message. strColor = The color to set for the status message. SP.UI.Status.removeStatus(statusId); // Removes the specified status message. SP.UI.Status.removeAllStatus(true); // Removes the all status messages. Use literal control to add notification from server side.